A simple truth about learning. A headteacher once explained how smart multimedia technology helped his students who had behaviour issues. Creating their own music and movies gave them a quick taste of success. "For any of us to start learning we have to take a chance," he said. "If you are not confident you cannot take that chance. Nothing gives you confidence like success." He built on quick successes to move the learning forward. 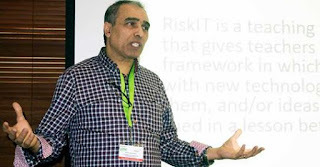 And this truth is at the heart of RiskITWeek, IT in the Classroom, A Risk Worth Taking, the recently published book by Abderrahmane 'Ben' Benjeddi. It may be a short and easy read but it's an extremely valuable one. That's because it has the power to change minds. There are a number of reasons behind the failure of many schools to comfortably embrace technology for learning. And this book addresses two: staff confidence with technology; school leadership and strategic adoption of ICT. It provides a mechanism where staff can try out products and services that interest them but which they have not been confident enough to previously try – and with the full support of the senior leadership team. The first thing to note is the RiskITWeek actually works and has already enjoyed some success. 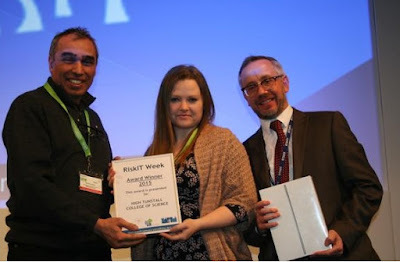 The author's work is already well-known to schools in east London and beyond and his RiskITWeek Awards were successfully hosted by the professional body for ICT professionals, Naace, and were in fact a high point of its annual conference. With his expertise, irrepressible enthusiasm and persistence, Abderrahmane Benjeddi has already established proof of concept and the ability to scale. His only problem has been that, as an independent educator, he has not enjoyed sufficient resources to push his project, something that could easily happen with the backing of a well-known brand for example. His RiskITWeek publication is the next stage on his journey. In it he shares the concept and practical ways in which teachers and their schools can put it to good use to improve their professionalism and the learning for their students. The arguments are logical and coherent as are the examples (there is plenty of food for thought in chapters 5 and 6). All they need are take-up and leadership back-up. RiskITWeek makes perfect sense if only to make good use of the technology already invested in for schools, and which often lies around under-used or even in cupboards. But the most important purpose is for teachers to enrich their professional expertise and help make the teaching and learning more appealing and engaging for their youngsters. Abderrahmane Benjeddi deserves his own award for developing and sharing this work. It undoubtedly stems from his own life experience in education across countries and continents and his own indefatigable determination to learn and share his learning. His own story and his journey from Morocco to university in France and then on to England where he qualified as a teacher is inspiration in itself. At just over 100 pages there's no excuse for not engaging with RiskITWeek. Its cover price of £9.99 is a snip, and smart school leaders could do no better than also engage the services of Abderrahmane Benjeddi (or his Naace associates) to get the very best out of the CPD for their own RiskITWeeks. Developing a 'can do' culture is no small thing for any school; the staff become better teachers and the learning improves for the children. This book is an unadorned gem, much like the author. 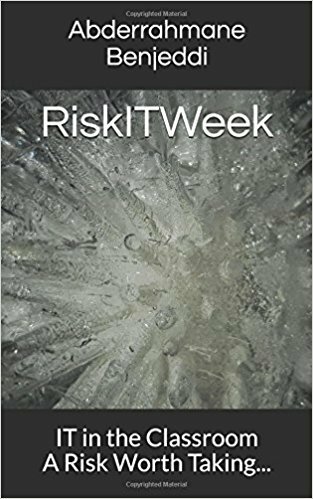 RiskITWeek deserves a wide take-up.